It’s Memorial Day weekend, the official kick-off to summer. In a few hours, the Indy 500 will start, and grills around the country will fire up. But to me, Memorial Day always meant two things: the race on the radio, and ants. Peonies and ants: pillars of my childhood. When I was a child, we would head out to the cemetery to decorate graves sometime Memorial Day weekend. And our decoration of choice was peony. Lovely, glorious peony, whose giant pink or white blossoms can make up a bouquet out of three stems. 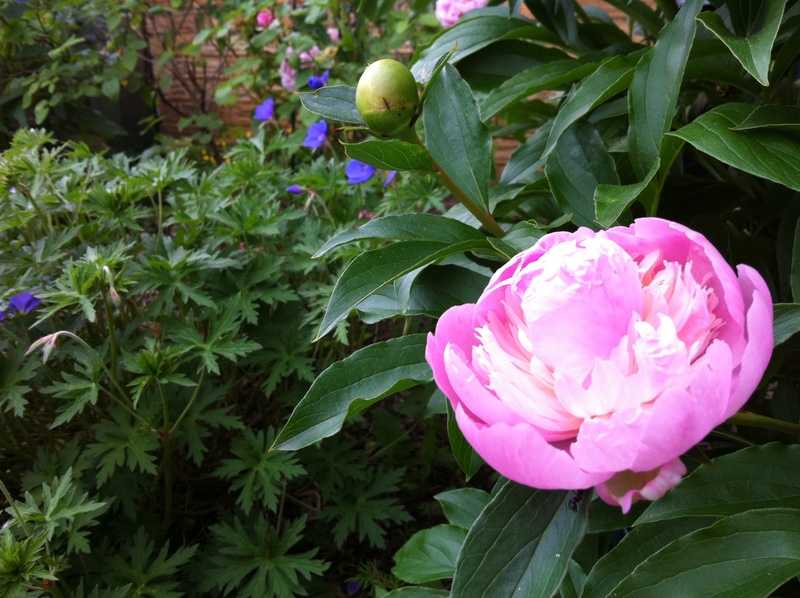 Peony, that flowered in profusion in late May (spring came later in the ’80s than it does now). Peony, that hosted enough ants to populate a couple hundred ant farms. The peonies that remind me, too, of my grandmother, who was no green thumb, but nonetheless had a peony border that seemed to stretch to infinity. The lavender, a tribute to my favorite college professor. For several years I helped her harvest whacking great heaps of lavender to turn into wands and wreaths and sachets. Every time I smell the heavy, crisp fragrance of lavender, I think of the woman who inspired me to garden. The brilliant tulips and daffodils in spring, whose bright colors always make me think of my mother. Truth be told, I grow them as much so I can take bouquets to her as for the relief of their bold hues after yet another grey winter. The strawberries out front, which are a payback to the lovely neighbor who never minded the kids who raided her raspberry canes. (Our childhood rule? The berries that grew through the chainlink fence near the sidewalk were fair game for any kid riding her bike.) Kids in my neighborhood know they’re allowed to pick and eat the strawberries that grow between the sidewalk and the street. And, of course, the Chicken Palace, a tribute to the love and engineering skills of my dad, who built me a magnificent structure even though he thought I was a little nuts for wanting chickens in the city. And today I’ll head out to my parents house, where we’ll likely fire up the grill and put the race on the radio. The peonies have all faded by now (although they were glorious for Mother’s Day), but I have two flats of pachysandra to plant in a shady spot for my mother. And doubtless, I’ll find a few ants. So it must be Memorial Day weekend.